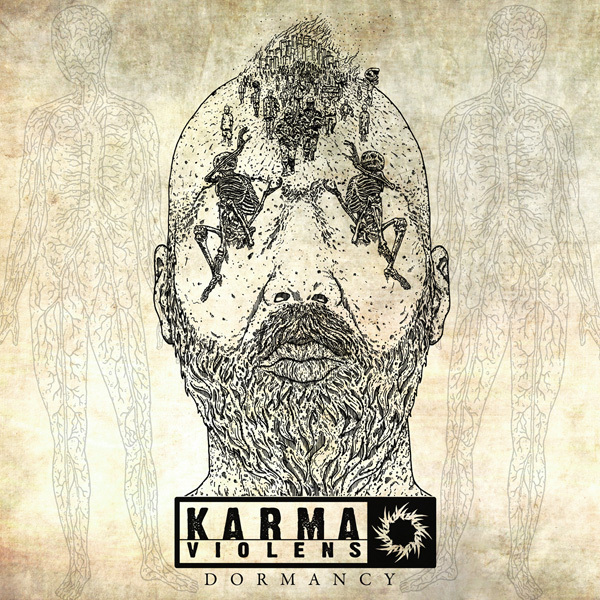 After 9 years of existence, 1 demo and 1 EP, finally the first full-length album of Karma Violens is released. After seeing them supporting the almighty Judas Priest on their final tour this summer, I was pretty sure that the aggressive feeling they had on stage would be depicted on the record as well. Dormancy is the name, extreme riffing is the game. This record really grabs you by the nuts from the beginning till the end. After being “dormant” for many years, the band has finally decided to strike. The first song “Animal” gets you in the mood for what’s coming up next. A sense of dark thrash/black riffs combined with drum blastbeats and brutal vocals is more than enough to do the trick. The second song “Full Dose Of Hate” is picking up where “Animal” left off and “Death Is Symbolic” is introduced by the great late Chuck Schuldiner, who speaks against categories in metal music, and naturally it contains many Death elements. The band’s lyrics are mostly about politics and reaction to everything which disturbs us in the society we live in. The next song “Christian Lovers (Made Me Do It)” needs no explanation as it is already a strong statement (and a personal favorite of mine). “Returning From Oslo” is also very good and in “Headstrong Vs. Progress” one can spot a lot of experimenting. The band easily blends all genres of extreme metal and the outcome is indeed way better than many others who tried doing the same. “Molotov Syrup” is a proof of that and one of the best songs on the album. The last songs on the album are “Storm Before Calm” where the aggressive riffing and drumming are at their best once more and “Dormancy” which is, as far as I’m concerned, an instant classic, combining the best elements of Karma Violens and satisfying even those who might not be so interested in the extreme genre of metal. The lack of guitar solos is a little obvious in some parts, but most of the songs are more than fine without them. This is definitely one of the best works from a Greek extreme metal band, a real mixture of pure roughness and excellent riffology with a very good production by Fotis Bernardo (Septic Flesh) and George Emmanuel (Valet Parn), which really leaves you wondering how their next album will sound like. Definitely a must for every Pantera, Machine Head and Slayer fan out there.